Photomontages of the 1930s from the collection of the Museum of Fine Arts, Houston, Texas. John Heartfield worked as a film designer and director, and was a founding member of the Berlin Dada group of 1918. The photomontages for which he is best known were invariably produced for publications, often for the anti-nazi, communist weekly A.I.Z. The work is highly charged political satire, important for the innovative use of photographic collage as well as the effective use of the media for political protest. According to Eckhard Neumann, Heartfield's form of communication "ripped the facades of reality and afforded to the observer a view behind the visible, by unmasking the nature of opponent." Eventually, the publications which Heartfield associated with in Germany were banned. Due to their publications endeavours, he and his colleagues, George Grosz and editor Weiland Herzfeld, were tried for blasphemy during the last years of the Weimer Republic. In 1933 they, and the magazine The Malig-Verlag, fled Germany. Heartfield was interned in a number of English camps during the war and finally settled in Leipzig in 1950. Later he worked as a graphic and theatre designer for Bertoldt brecht's Theatre Ensemble in Berlin. Supported by the Canada Council, and the Goethe Institute in Vancouver. A catalogue was published by Presentation House Gallery in conjunction with the exhibition, with an essay by Bob Sherrin. 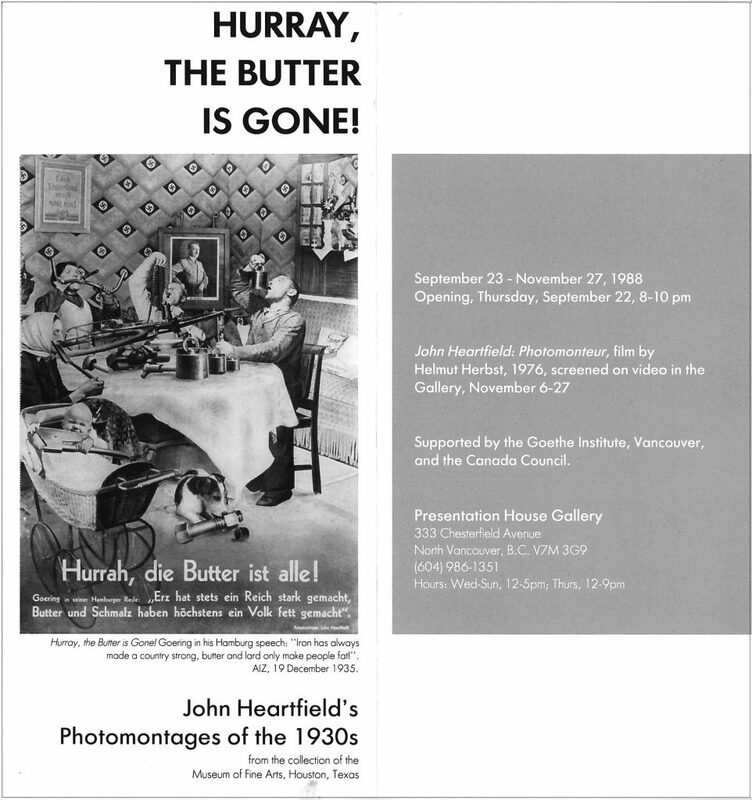 The publication from our 1988 exhibition Hurrah the Butter is Gone , The Photomontages of John Heartfield. John Heartfield worked as a film designer and director, and was a founding member of the Berlin Dada group of 1918. The photomontages for which he is best known were invariably produced for publications, often for the anti-Nazi, communist weekly A.I.Z. 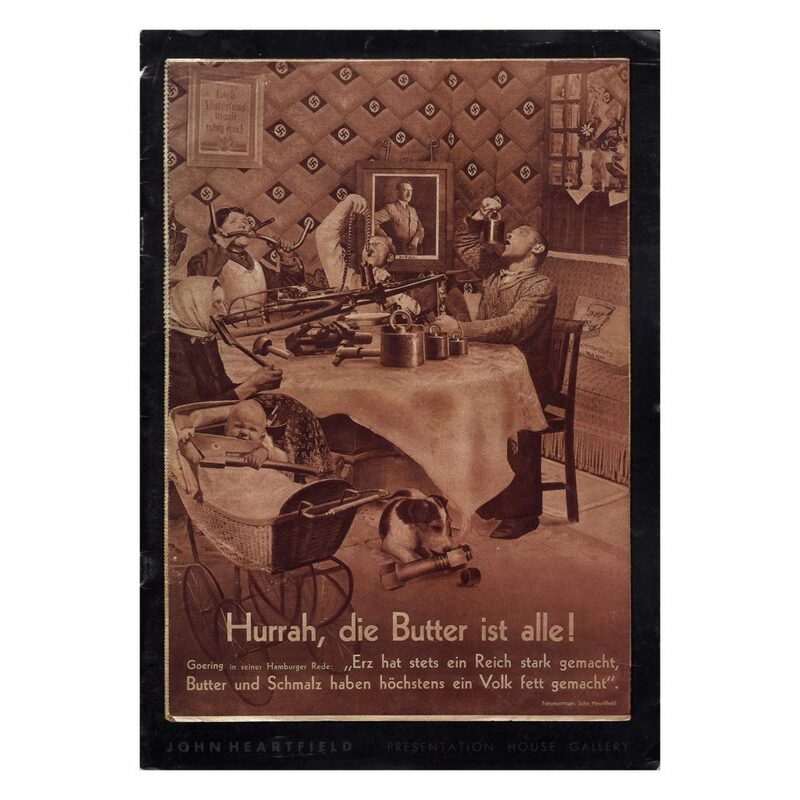 The work is highly charged political satire, important for the innovative use of photographic collage as well as the effective use of the media for political protest. According to Eckhard Neumann, Heartfield’s form of communication “ripped the facades of reality and afforded to the observer a view behind the visible, by unmasking the nature of opponent.” The 51 issues of Arbeiter-Illustrierte-Zeitung, (Workers Illustrated Magazine) referred to as AIZ were on loan from the collection of the Museum of Fine Arts, Houston, Texas. Curated by Gallery Director Karen Love. Catalogue text by Robert Sherrin. Designed by David Clausen and printed by Hemlock Printers.